Lately I haven’t been able to write my restaurant reviews as frequently as I eat out. 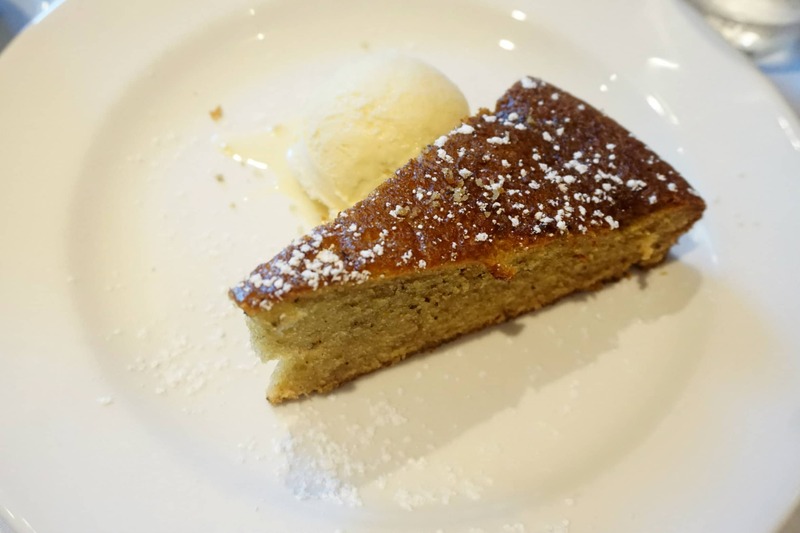 So many of the places I haven’t reviewed in the past are really worth mentioning on my blog. Some may be even better than restaurants in Los Angeles I’ve reviewed at greater length. 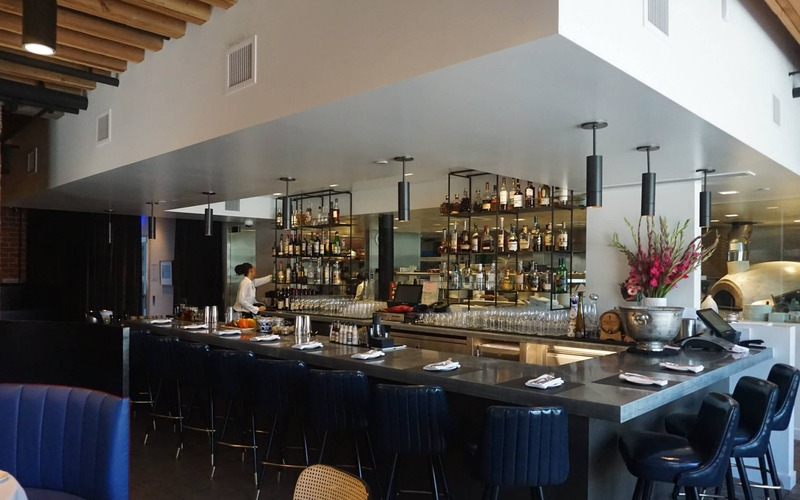 So here you will find a running list of places where you can eat and drink in the Los Angeles Metropolitan Area. These reviews will not be comprehensive, but rather summaries to share my experiences to help you find new places to try. Read Explanation of the Belgian Foodie Rating System for Reviews to understand the criteria considered when attributing ratings. Click to discover more wonderful resources to help you find your next restaurant. If you discover a great place to eat or drink, please share your experience in the comments below. Below are summary reviews of restaurants in Los Angeles. The newest additions will appear at the top of the list. Come back here often to find new reviews of restaurants in Los Angeles. 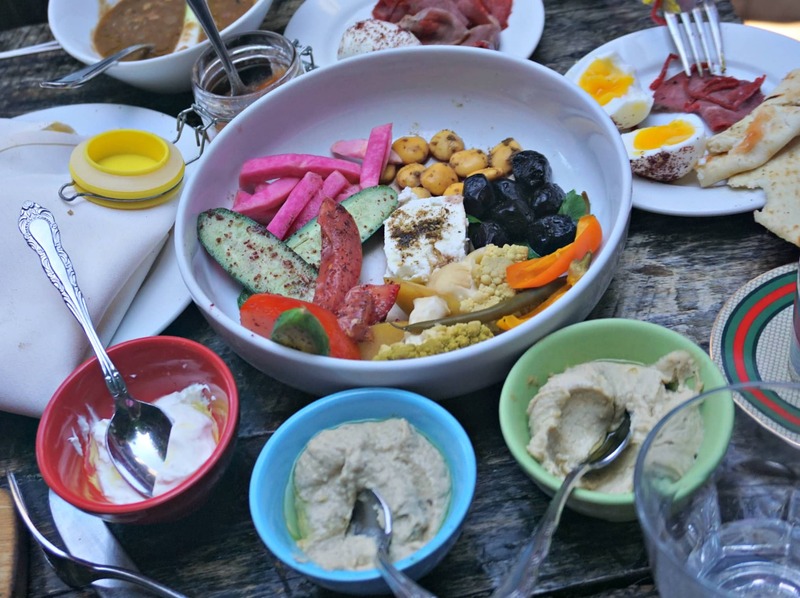 Bowery Bungalow is an ideal place for a weekend brunch in Silverlake. They offer creative and sumptuous Mediterranean-style dishes that can either be shared or eaten on your own. Recently a group of friends and I enjoyed a long table on their outside patio. Try to sit outside if the weather permits, as it’s a more attractive decor than inside. 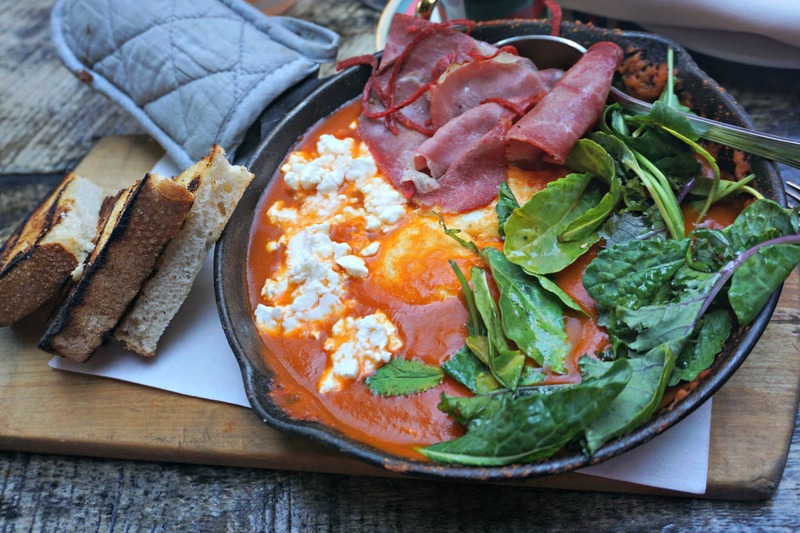 The Shakshuka North African Tomato Stew, Blue Crab Benedict and the Middle Eastern Breakfast for Two are all good choices. During the week Bowery Bungalow is open only in the evenings for dinner. Check out the brunch and dinner menus on Bowery Bungalow’s website as it changes with the seasons. Be careful not to drive by the Bowery Bungalow, as it’s easy to miss. Street parking is fairly easy to find near Bowery Bungalow. I invited my father for lunch at Nerano after reading rave reviews. 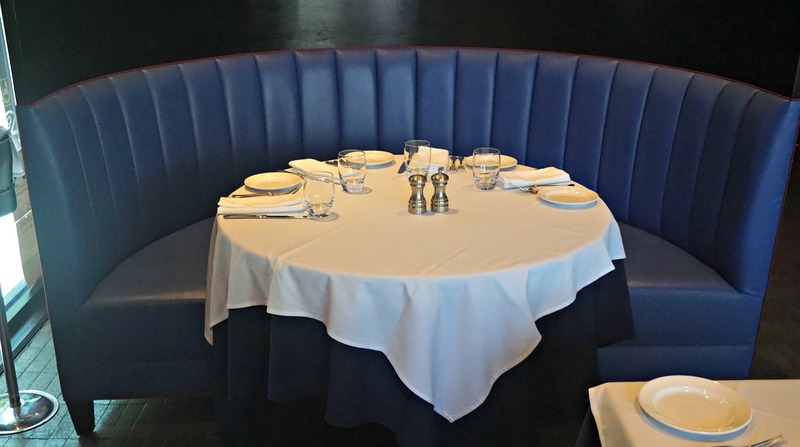 He loves Italian food, appreciates a comfortable quiet setting and adores good service. Nerano satisfied all these criteria. 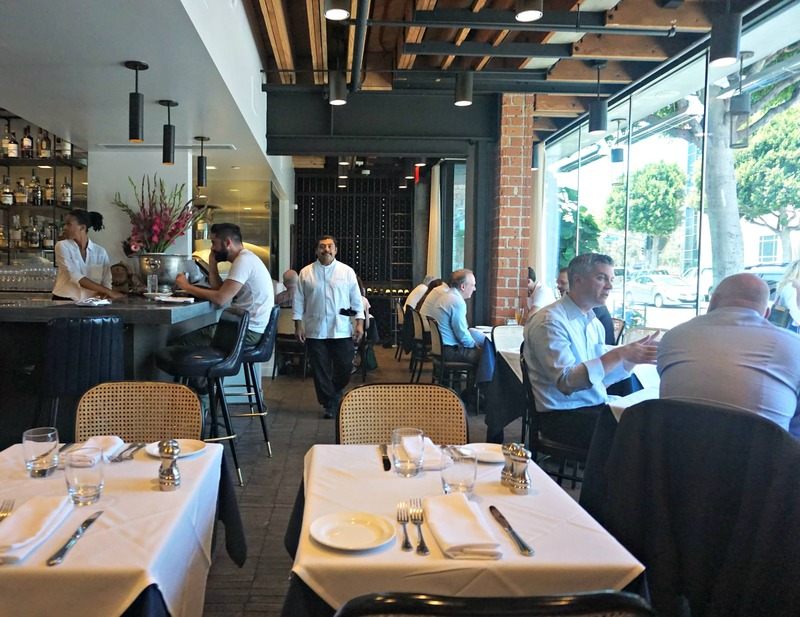 The owners of the popular Toscana restaurant in Brentwood opened Nerano last November in Beverly Hills. Located on a stretch of South Santa Monica Boulevard that has found new life, Nerano is within close walking distance from the Peninsula Hotel, the new Waldorf Astoria and the Beverly Hilton. 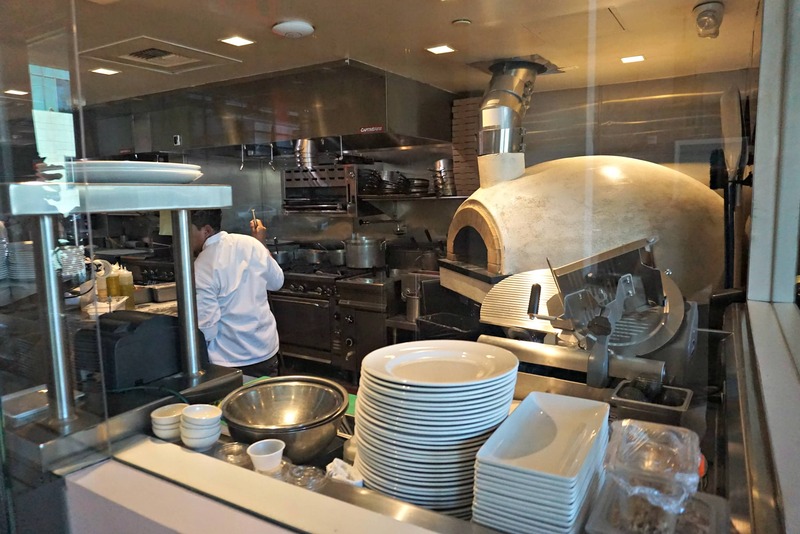 Nerano’s menu showcases upgraded versions of several classic dishes. For lunch you can start with antipasti and then follow up with your choice of pizza, pasta, salad, meat or seafood. We skipped the antipasti to save room for dessert. 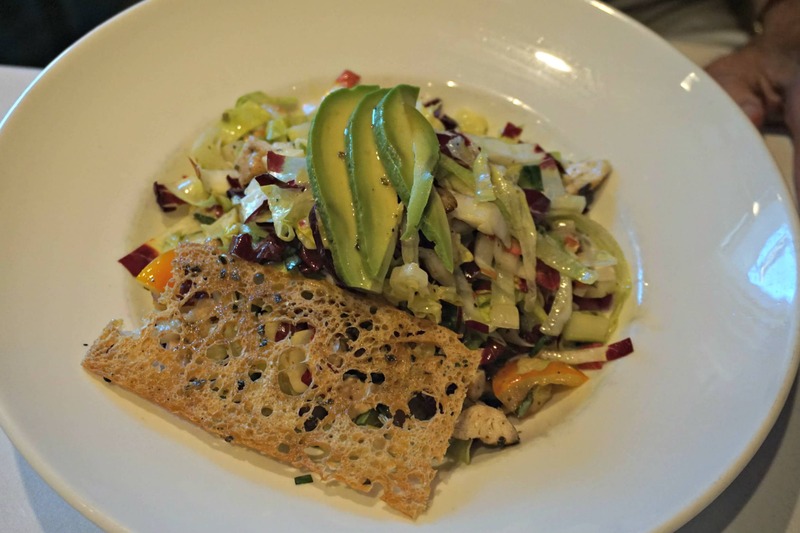 My father selected Jane’s Chopped Salad composed of grilled chicken and vegetables. Not only was Jane’s Chopped Salad attractive, it had texture. The chef apparently cut the vegetables by hand instead of using a food processor, like chefs at many other restaurants. It was refreshing to see odd-sized slices of vegetables rather than everything being cut the same size. My father enjoyed the sensation of the salad’s texture in his mouth. 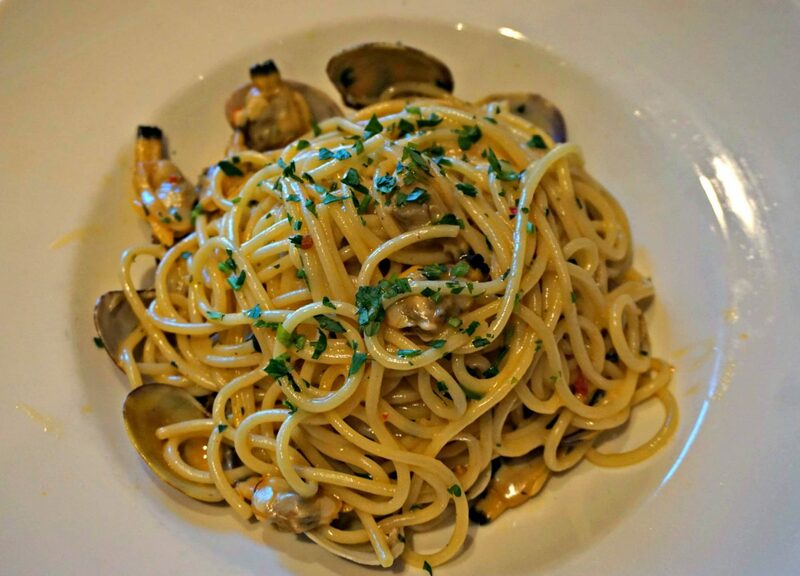 Upon our server’s recommendation, I ordered one of my favorite dishes, Spaghetti alle Vongole (Spaghetti with Clams). It was absolutely delicious in its simplicity and flavor. Often restaurants serve an oily version of Spaghetti alle Vongole. Almost always oil splatters on my shirt as I eat Spaghetti alle Vongole. Not this time. The fresh homemade pasta was prepared al dente, with the right amount of wetness. I loved it! 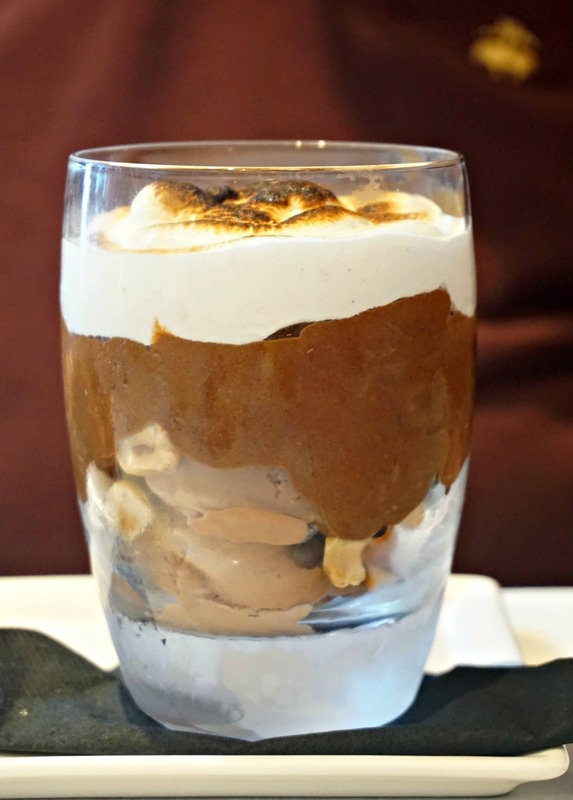 We ended our lunch with Chocolate Mousse with Hazelnut Gelato and Olive Oil Cake with Vanilla Bean Gelato. Both were yummy! Nerano’s decor is simple, comfortable and elegant. 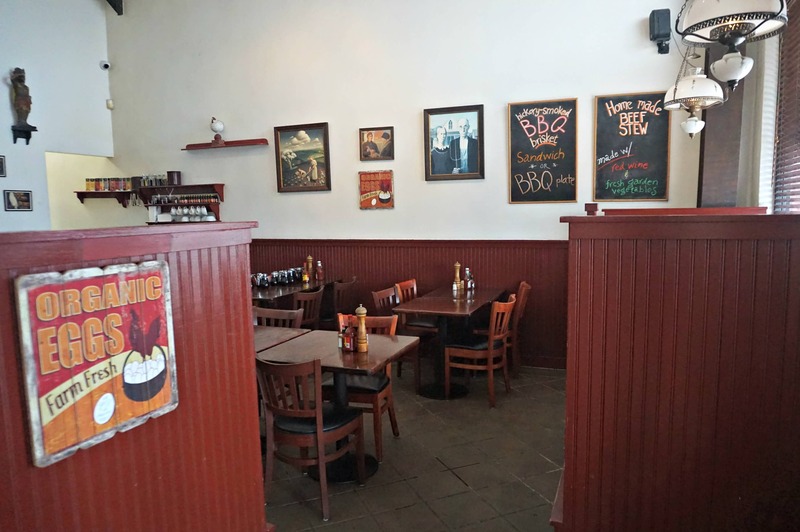 It’s perhaps a bit on the masculine side, yet has a few cozy booths that soften the atmosphere. 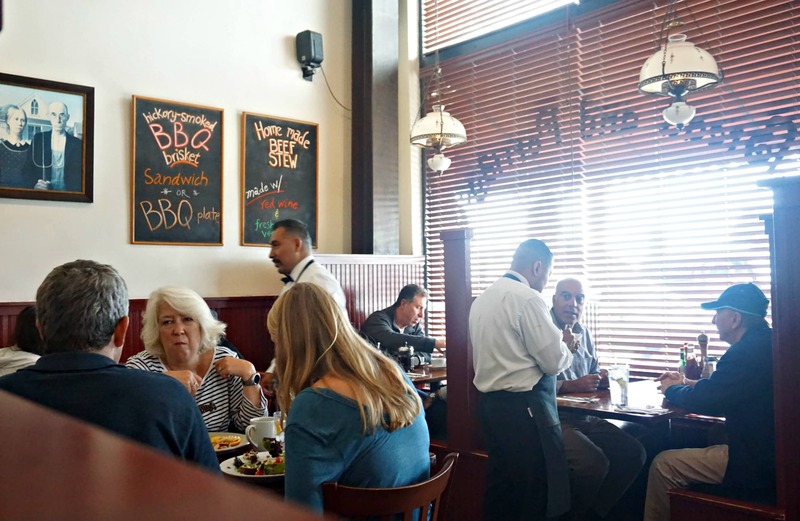 At lunchtime the restaurant is full, with a mix of business and more casual customers. I’ve heard that the evenings are even more busy, with several sitting at the bar. In the main dining room several smallish tables sit side by side with a stunning bar on one side. From the bar and the dining room customers can watch the activity in the kitchen through glass walls on two sides. 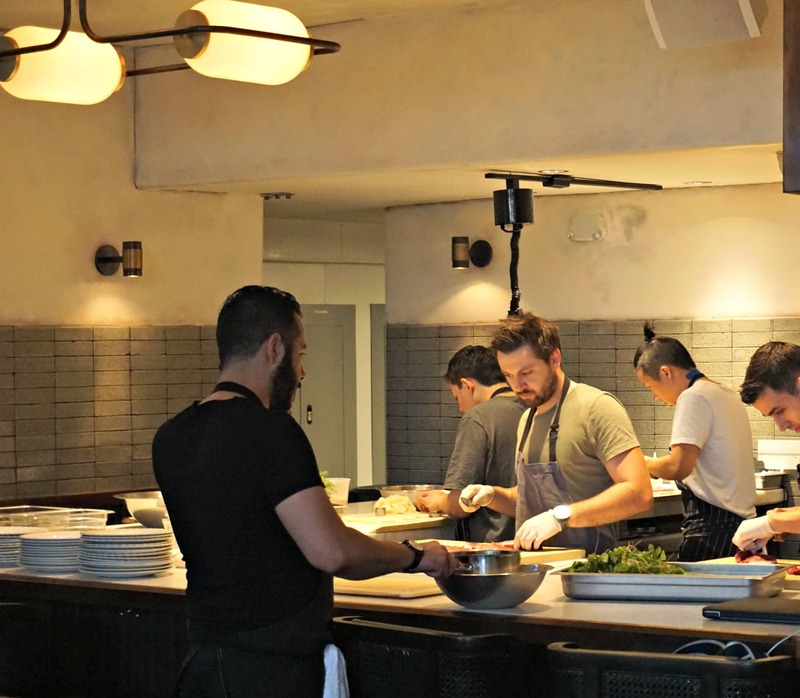 Many restaurants feature an open kitchen, yet this one at Nerano is stylish and functional. The glass walls block all sound from the kitchen, while blending in perfectly with the rest of the decor. Another rear dining room is a bit more quiet with several booths set up along the wall. This room would be perfect for people wanting to have a more intimate conversation. Upstairs there is a lounge that is open in the evenings with two separate happy hours: one before dinner and another after dinner. Apparently the vibe is different during both happy hours. As the lighting darkens outside, the later happy hours has a more romantic atmosphere. The upstairs lounge is also available for group parties during the day. It’s been a long time since I’ve experienced such professional yet friendly service. The server welcomed us, explained the menu options and guided us through our meal without rushing us as we leisurely enjoyed our meal. When one of us left the table, the server refolded our napkin so it was neat upon our return. The servers clearly had experience in paying attention to small details that make the difference. My father had a minor accident at the restaurant and needed some care. The bartender was magnificent as she cleaned and bandaged the wound. She had previous first aid experience, which made a huge difference on this occasion. She managed a potentially bothersome event excellently. For me the prices seemed high. Our lunch consisting of one course plus dessert and espresso for each of us cost about $100.00 with tax and tip included. I find this a bit excessive for such a lunch, especially since neither of us ordered any drinks except espresso. Yet, you have to remember Nerano is in Beverly Hills, catering to a crowd that can pay this amount without worry. As mentioned above, the restaurant was full at lunchtime. Although Nerano is new, several guests seemed to be repeat customers. They must know their audience. I found, Nerano’s food, atmosphere and service to be excellent. 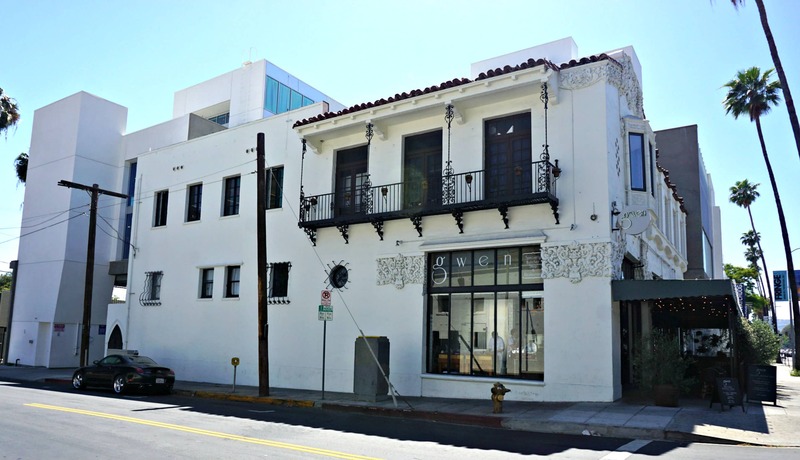 The location is close for people coming from Beverly Hills, Westwood, Century City, and West Hollywood. However, Nerano is located close to a major intersection that experiences heavy traffic at various times of the day, which might make it more difficult to reach from other parts of the city. Perhaps this traffic provides yet another reason to stop at Nerano to enjoy its earlier happy hours before continuing home. Of course, watch your alcohol consumption before taking the wheel. The prices, however, are expensive. At least for such prices you know you will enjoy your food and beverages. You cannot always expect this at restaurants where you pay less money. I’d recommend trying out Nerano to make your own opinion. If you go on a date, request one of the booths. The single booth in the main dining room has a good view of the entire room, yet you are a bit removed from the others. Bread and Porridge has been a favorite neighborhood breakfast and lunch place since it opened in 1994. It’s open from 7:00 am to 2:30 pm 365 days a year, except Thanksgiving, Christmas and New Year’s Day. The menu at Bread and Porridge features traditional breakfast dishes, such as several variations of pancakes and omelettes, as well as some popular lunch salads, pastas and sandwiches. You will not find any indications of vegan or gluten-free on their menu like you might at some newer establishments. The offerings are just plain old good food. I ordered the Classic Cobb – Original Brown Derby Recipe. The title intrigued me. 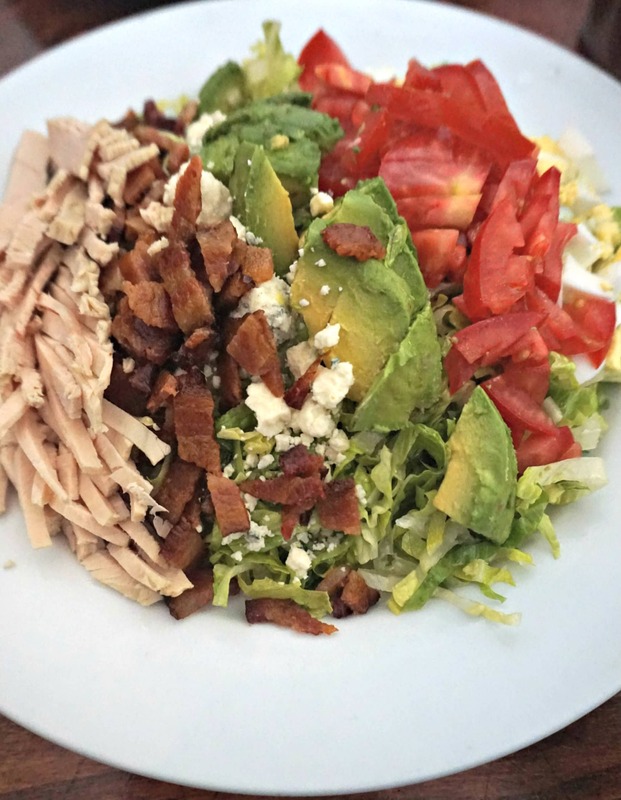 How did the original Cobb Salad taste? Was the Brown Derby really the restaurant that created this classic salad? I enjoy a Cobb Salad, yet often find it a bit too rich for my taste. Restaurants tend to make the dressing too creamy or cheesy. The Classic Cobb at Bread and Porridge hit all the right notes. The red-wine vinaigrette dressing enhanced the flavors of the other ingredients in this timeless chopped salad without overpowering the salad. I would definitely recommend this Classic Cobb Salad. 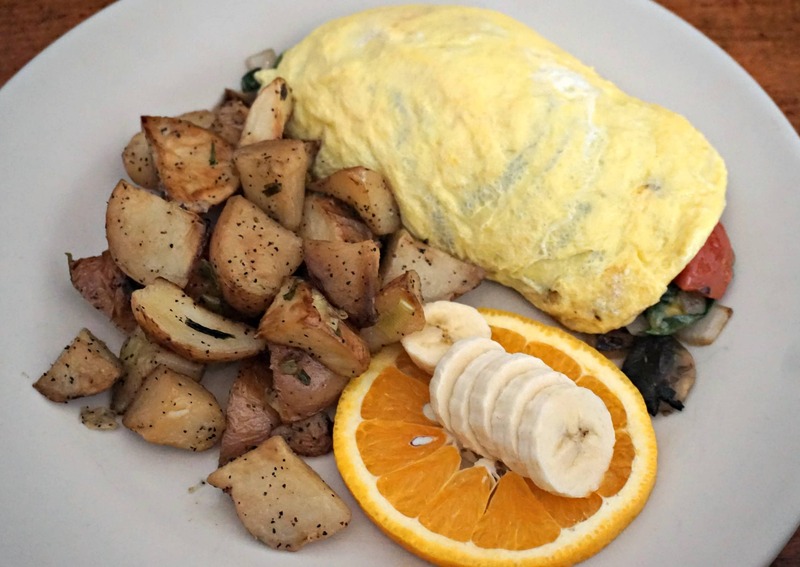 My friend ordered and enjoyed the two-egg Spinach Omlet served with roasted potatoes. The Bread and Porridge has two dining rooms. One main room with booths and tables. The second room has a few tables along with a couple sofas. The sofas are ideal for people wanting to relax with their cup of coffee as they read a book or work on their laptop computer. By the way, there is free WiFi at Bread and Porridge. Mark Rothschild, the restaurant’s owner, can be seen at Bread and Porridge on most days. His presence adds to the restaurant’s homey feel. Everyone working at Bread and Porridge are part of a team. Each team member learns to work in each role in the restaurant so they understand all aspects of the business. Service is real friendly and professional. Our server was extremely helpful to us choosing among the lunch options. The prices at Bread and Porridge are good considering the quality of the food, the atmosphere and the location. 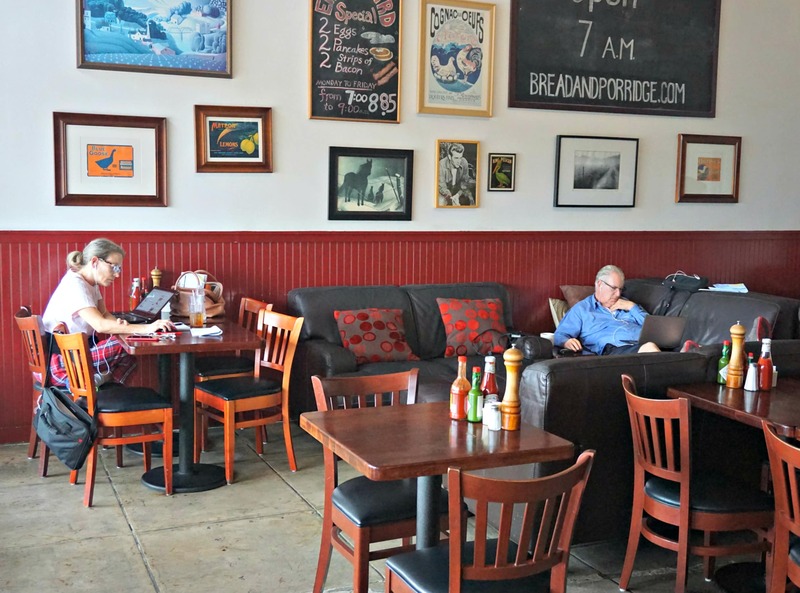 I’d recommend eating at Bread and Porridge if you are looking for a homey neighborhood restaurant with traditional dishes. 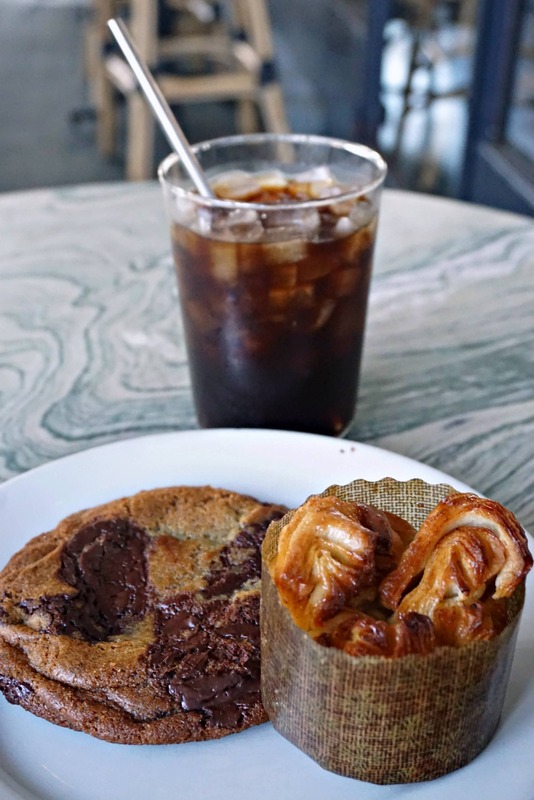 Toasted and Roasted on Melrose Avenue in Hollywood is a wonderful place to enjoy coffee, food and even entertainment. Many customers also take advantage of the free WiFi and artsy atmosphere to work on their laptops. Plug outlets are scattered all over Toasted and Roasted, making it easy to recharge your devices. 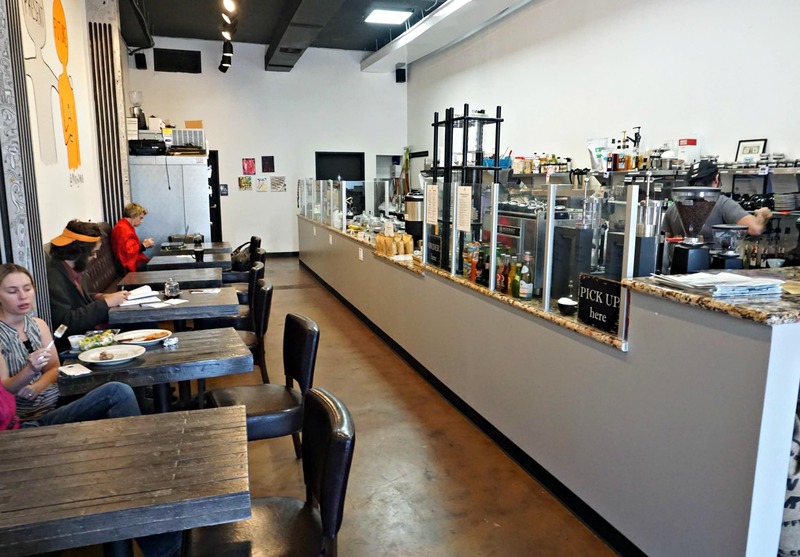 A husband and wife team opened their micro-coffee roaster and cafe a couple months ago. Everyone who works at Toasted and Roasted is super friendly. 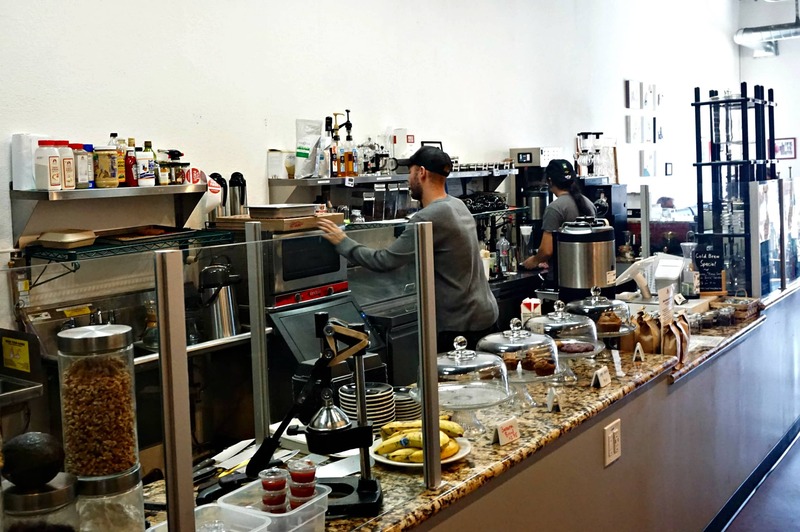 Their hands-on approach shows in almost every aspect, as does their willingness and intent to make Toasted and Roasted a favorite local cafe. The idea for the micro-coffee roaster stems from the husband’s dream and passion to make the best coffee available. 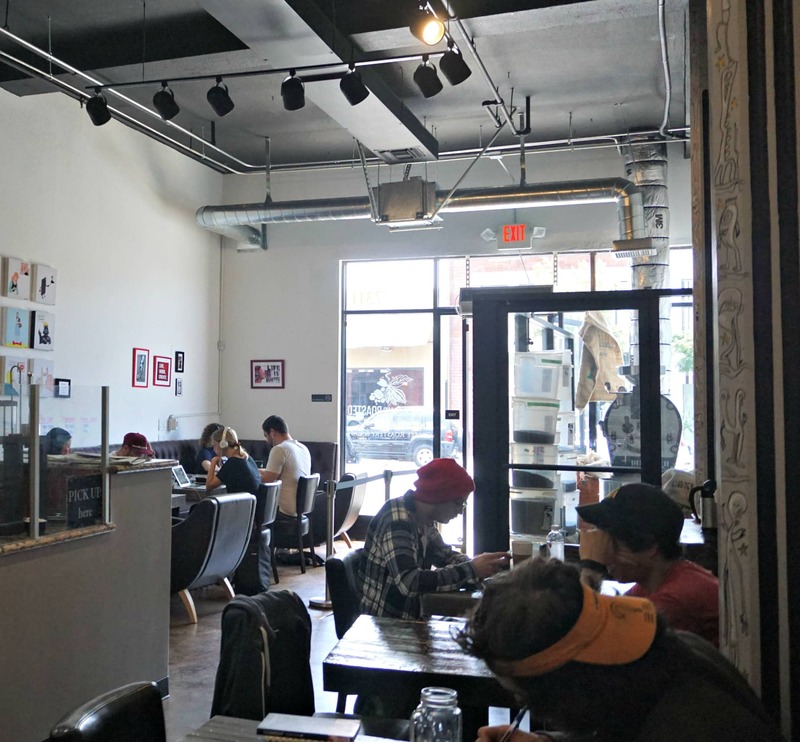 They offer several house-made coffee options. For each you can choose how you would like it prepared: drip, French press, espresso, etc. Their coffee is still a work in progress as they search for the best blends. While their typical French press contains 22g (0.78oz) of coffee grounds for 330 ml (11.64oz) of water, I prefer a more concentrated taste resulting from 25g (0.88oz) of coffee grounds. Toasted and Roasted offers sweet and savory options to eat during the day. I’ve tried a blueberry muffin and one of their signature Waffle Puffs, an original dish created by them. 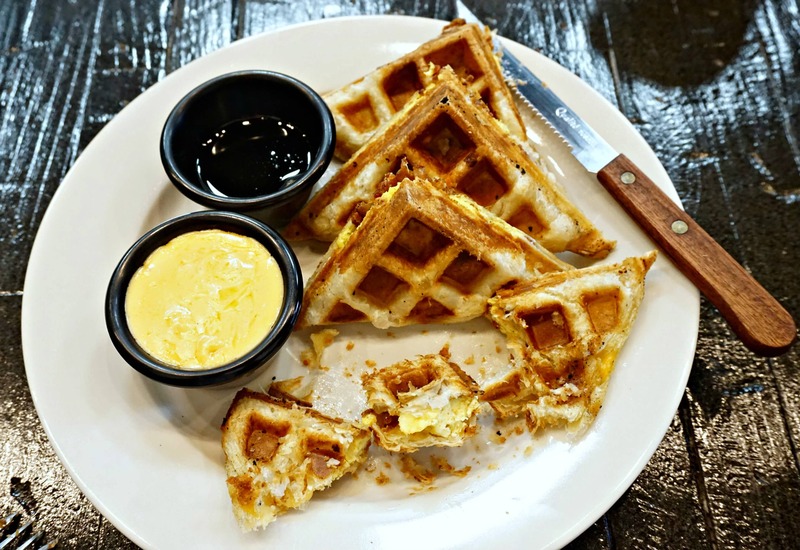 Waffle Puffs are actually filled waffles, which can be prepared both sweet and savory. I tried the Baconator, which is filled with scrambled eggs, bacon and cheese. Having lived in Belgium for 26 years, I love this new creative take on a waffle. Never have I seen such an idea realized. By the way, it was yummy and satisfying. My first time at Toasted and Roasted they had an open mic with several people taking turns doing comedy. 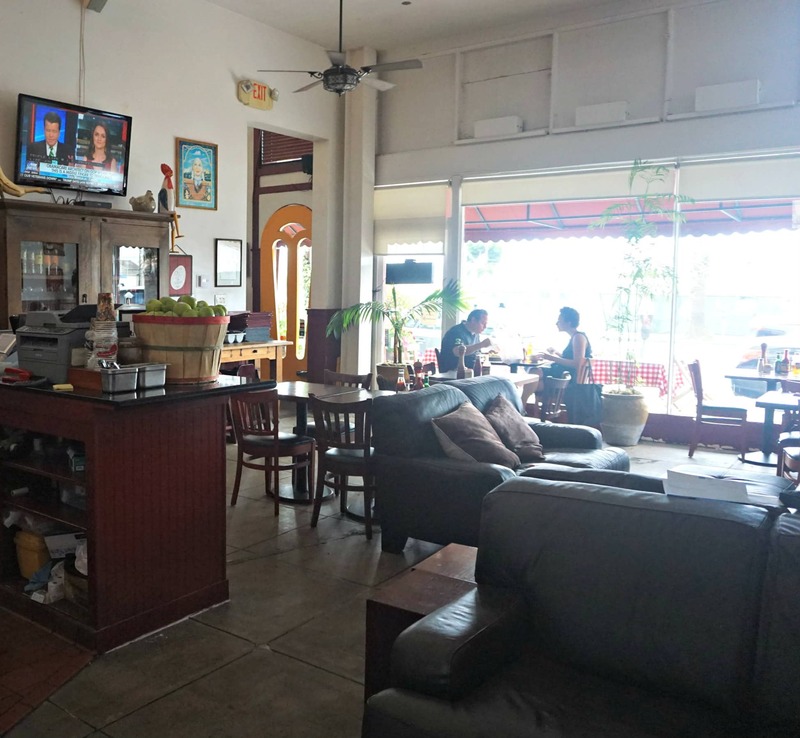 Located a couple doors away from the renown comedy and theater school, Groundlings, having an open mic a few late afternoons / early evenings each week seems like an ideal way to link with the community around the cafe. It’s also a brilliant opportunity for the hordes of people in Los Angeles trying to get discovered for their comedic talents. 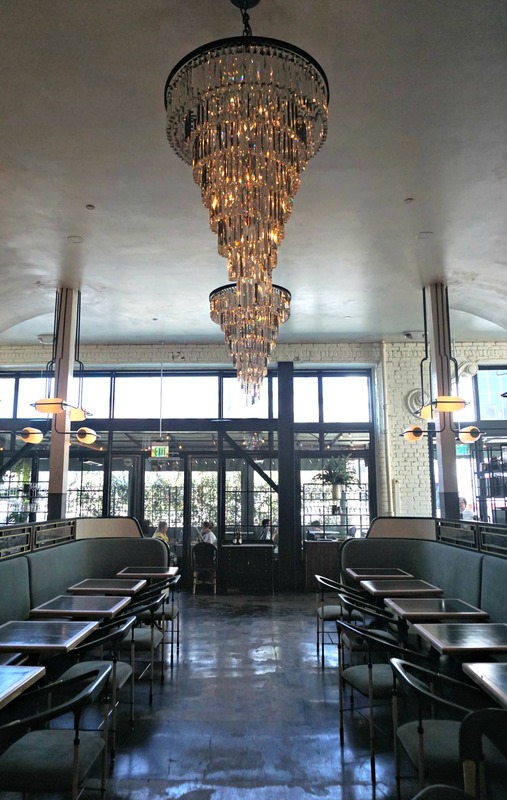 I stopped by Gwen, Curtis Stone’s second restaurant on Sunset Boulevard in Los Angeles (Hollywood), to check it out since it’s in my neighborhood. During the day and evening Gwen Butcher Shop offers top quality specialty meats from around the world for sale at fairly reasonable prices. Customers can also purchase sandwiches, quiche as well as cookies and pastries during the day at the Butcher Shop to eat on the terrace or to go. 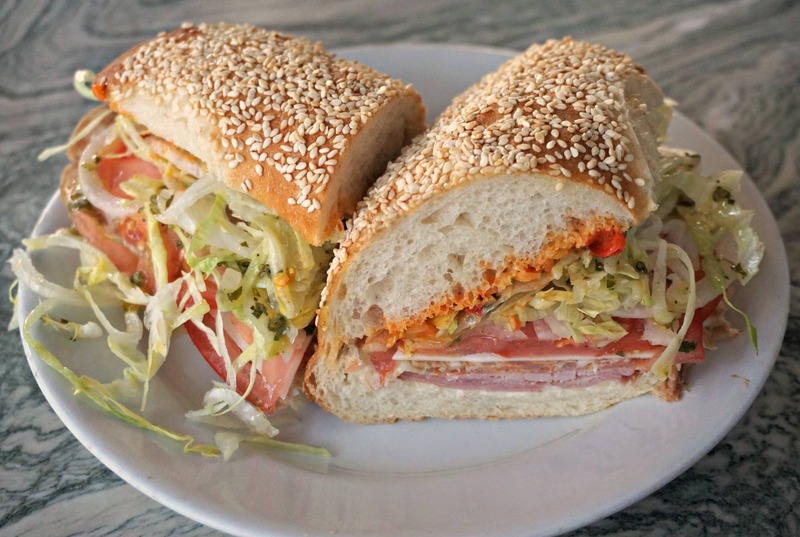 I chose their Grinder Sandwich made of sliced Italian charcuterie, Provolone cheese, lettuce and a wonderful spicy sauce between sesame seed rolls. For $12.00 the Grinder is a bit overpriced, yet it hit the spot with its full flavor. I enjoyed it with a cold brew coffee on ice. Afterwards I indulged myself with two desserts: a Chocolate Chip Cookie and a Monkey Bread pastry. 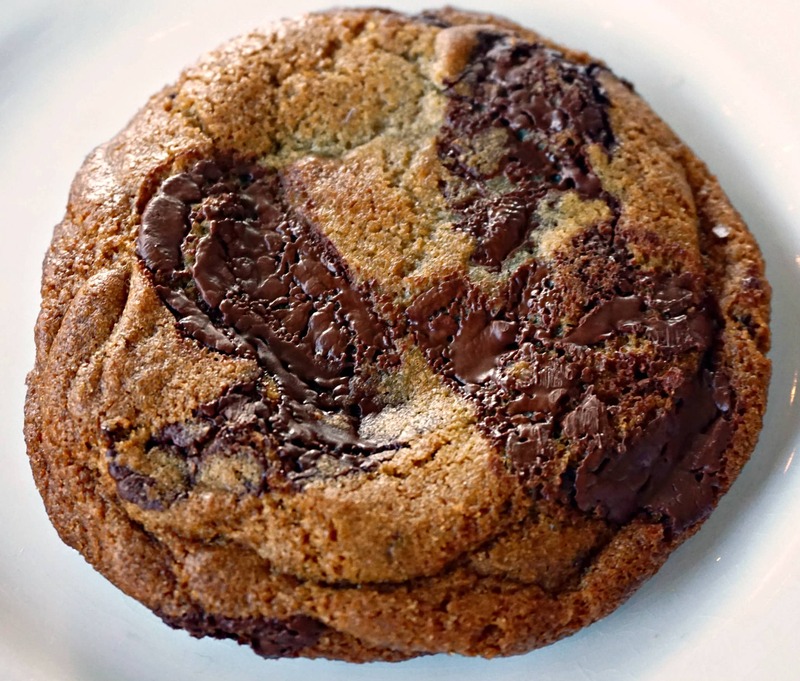 The Chocolate Chip cookie was giant, gooey, and loaded with chocolate. For $2.50 this cookie was the best deal in Los Angeles! It completely satisfied me. Yet, that did not stop me from eating the Monkey Bread recommended by Daniel at the Butcher Shop counter. Gwen’s homemade buttery croissant dough is also used for the Monkey Bread pastry. I expected the Monkey Bread to taste more like caramel and cinnamon. 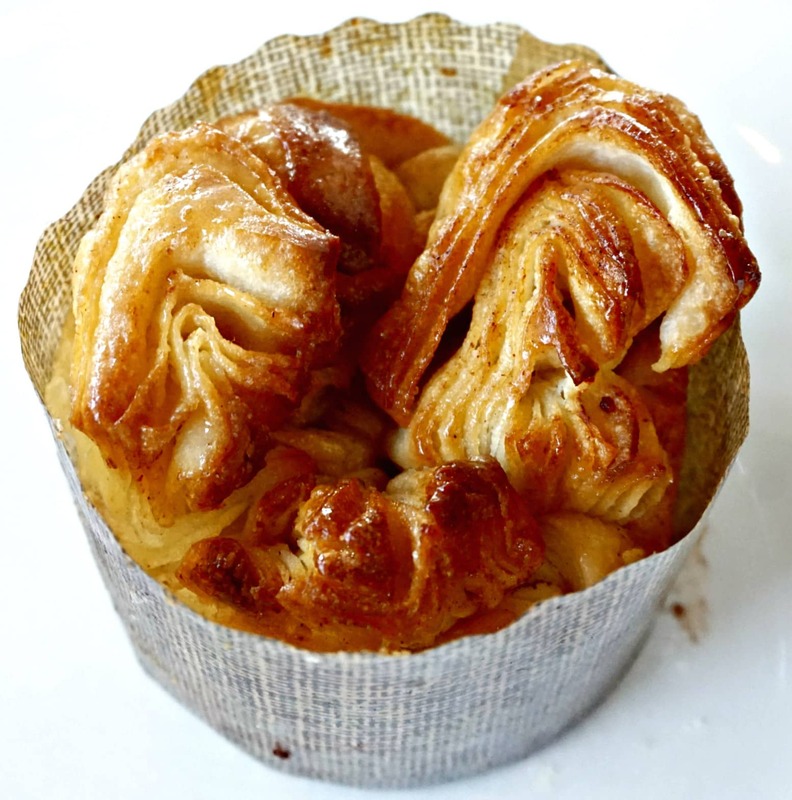 Instead it resembled a moist kouign amman, which is no complaint for me. Gwen’s terrace is quiet, shaded and perfect for eating and relaxing. An awning and vines shield you from the hustle and noise on the street. It’s free WiFi also makes it an ideal place to work on your computer. I really want to return in the evening to try the seasonal tasting menus offered in the Gwen Restaurant. The dining room, decorated in Art Deco style, seats 42 people downstairs for the tasting menu. Customers can eat off of the à la carte menu in the bar and terrace areas. When the restaurant becomes extremely busy, an upstairs room seats an additional 26 people for the tasting menu and features its own bar. The guides and websites below will help you find your next meal. This list is not exhaustive. Each October, the iconic food critic for the Los Angeles Times, Jonathan Gold publishes an updated list of the 101 Best Restaurants in Los Angeles (and surrounding areas). The most recent list was published on October 23, 2017.